Growth form: Annual or biennial herb. Flowering. Mar–Apr. Status: Native. Very common. Also recorded: Bahrain, E Saudi Arabia, UAE. 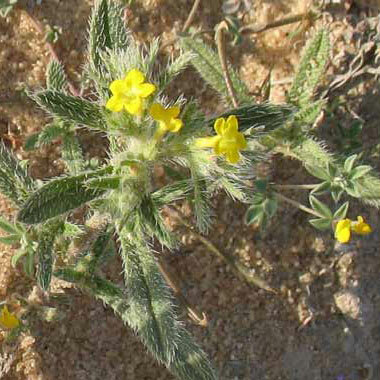 Habitat & distribution: Abundant on shallow sandy deposits in all habitat types except saline areas. Perhaps more abundant in S and SW Qatar. Uses: ‘Women formerly used the powdery red dust, that rubs off the thick dark-red roots of these plants, as a cosmetic’ (Cornes & Cornes). Root strongly red and probably used as a dye (Mandaville). The cosmetic use also recorded for the UAE. The whole plant is used for fevers including malaria (Ghazanfar).